My mother claims I am named not after Katharine Hepburn, glamorous icon of stage and screen, but after my paternal grandmother. In which case I am very lucky not to have ended up called Ingeborg. 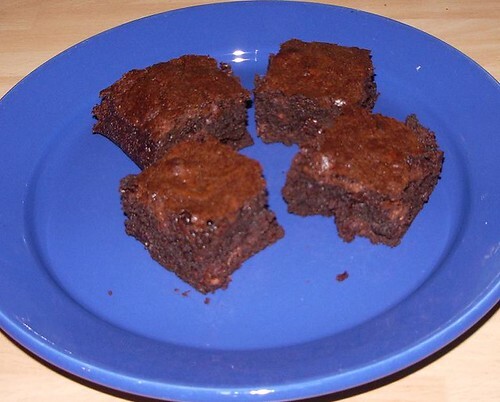 These are Dorrie Greenspan’s “Tribute-to-Katharine-Hepburn Brownies” that are currently doing the rounds in the baking blogosphere. (Aside – also interesting to note the various mis-spellings of the name Katharine. These are the bane of my life and the main reason I became Kat, rather than Katharine. Sorry Mum – if you’re going to raise a spelling pedant, don’t give her a weirdly-spelt name…). Frankly, these brownies are delicious and I have eaten far more than can possibly be good for me. I made them without nuts, and with a mix of Green and Black’s dark and milk chocolate. And I think I cooked them slightly too long, as I like brownies to be really gooey. This was also my first foray into baking with an American flavour – or should that be flavor? (Gnnnnnnh). I recently bought Dorrie Greenspan’s book – Baking, from my home to yours – which necessitated the purchase of a set of American measuring cups. My sister in Canadia is a big fan of cup baking, but I remain unconvinced. I had a few issues with using cups, namely how to fill a cup with flour or cocoa if it won’t fit into the bag. So it was a bit messy, but the resulting brownies are awesome.